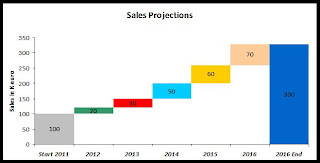 Waterfall Charts are consultant's favorite charts!. No wonder they are often referred as McKinsey style waterfall chart! Apparently they look difficult to create but once you know the secret, it works like magic. They are the best choice if you want to show how increments and decrements impact quantitative change in a given parameter. In the year 2011, your company sales are 100K €. You have a plan to reach 330 K € by 2016. The trick is - arrangement of data and hiding some components of a normal stacked bar chart! I have explained the same in the attached excel. Have a look at it! Even if you do not understand.... no problem.. use ready made charts from the same excel! I have given 4 different scenarios of the same chart.